Tagbilaran City, Bohol - The San Antonio Spurs banked on a 37​-point first quarter output and ​-15 first and 67 bench points to beat the struggling Chicago Bulls 133-94 Saturday night (Sunday Morning, Manila Time) at the AT&T Center in San Antonio, Texas​. 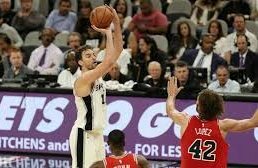 ​Veteran center Pau Gasol led eight Spurs in double figures with his double-double performance of 21 points and 10 rebounds, to go along with 4 assists, 2 steals and a blocked shot. The Spaniard was efficient from the field, making 8 of his 11 attempts, including a perfect 3 for 3 from beyond the arc. It was a total team effort for Spurs ​h​ead Coach Gregg Popovich's wards, as they shot well throughout the game making 60 percent from the field, and shot even better from deep with a season high 18 makes for an amazing 66.7 percent 3-point field goal shooting for the entirety of the game. The Spurs relied on effective ball movement as they had 33 assists, while only committing 13 turnovers. The Spurs now improve to 8 wins and 5 losses, while still waiting for top dog Kawhi Leonard and veteran starting point guard Tony Parker to return from injuries. The Bulls dropped to a dismal 2-9 win-loss card. Up next for the Spurs are state rivals Dallas Mavericks on Tuesday, November 14, 2017 (Wednesday Morning Manila Time), while the Bulls will take on the Oklahoma City Thunder on Wednesday night (Thursday morning Manila Time).